According to the Metta Sutta, cultivation of the four immeasurables has the power to cause the practitioner to be reborn into a "Brahmā realm" (Pāli: Brahmaloka). The Brahma-viharas, along with meditative tradition associated with Brahma-vihara, are also found in pre-Buddha and post-Buddha Vedic and Sramanic literature. Brahmavihāra may be parsed as "Brahmā" and "vihāra"; which is often rendered into English as "sublime" or "divine abodes". Apramāṇa, usually translated as "the immeasurables," means "boundlessness, infinitude, a state that is illimitable". When developed to a high degree in meditation, these attitudes are said to make the mind "immeasurable" and like the mind of the loving Brahmā (gods). English: four divine abodes, four divine emotions, four sublime attitudes, four divine dwellings. East Asia: (traditional Chinese: 四無量心; ; pinyin: Sì wúliàng xīn; Korean: 사무량심; Vietnamese: Tứ Vô Lượng Tâm; literally: "immeasurable states of mind, from apramāṇa-citta"), (traditional Chinese: 四等(心); ; pinyin: sì děng; literally: "four equalities/universals"), (traditional Chinese: 四梵行; ; pinyin: sì fàn xíng; literally: "noble Brahma-acts/characteristics"). Tibetan: ཚད་མེད་བཞི, Wylie: tshad med bzhi or Tibetan: ཚངས་གནས་བཞི་, Wylie: tshangs gnas bzhi . ...that practice [namely, the mere cultivation of love and so forth, according to the fourfold instructions] is conducive not to turning away, nor to dispassion, nor to quieting, nor to cessation, nor to direct knowledge, nor to enlightenment, nor to nirvana, but only to rebirth in the world of Brahma. According to Gombrich, the Buddhist usage of the brahma-vihāra originally referred to an awakened state of mind, and a concrete attitude toward other beings which was equal to "living with Brahman" here and now. The later tradition took those descriptions too literal, linking them to cosmology and understanding them as "living with Brahman" by rebirth in the Brahma-world. According to Gombrich, "the Buddha taught that kindness - what Christians tend to call love - was a way to salvation. A monk suffuses the world in the four directions with a mind of benevolence, then above, and below, and all around – the whole world from all sides, completely, with a benevolent, all-embracing, great, boundless, peaceful and friendly mind … Just as a powerful conch-blower makes himself heard with no great effort in all four [cardinal] directions, so too is there no limit to the unfolding of [this] heart-liberating benevolence. This is a way to communion with Brahma. The Buddha then says that the monk must follow this up with an equal suffusion of the entire world with mental projections of compassion, sympathetic joy, and equanimity (regarding all beings with an eye of equality). 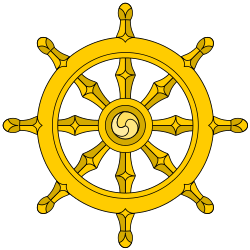 In the two Metta Suttas of the Aṅguttara Nikāya, the Buddha states that those who practice radiating the four immeasurables in this life and die "without losing it" are destined for rebirth in a heavenly realm in their next life. In addition, if such a person is a Buddhist disciple (Pāli: sāvaka) and thus realizes the three characteristics of the five aggregates, then after his heavenly life, this disciple will reach nibbāna. Even if one is not a disciple, one will still attain the heavenly life, after which, however depending on what his past deeds may have been, one may be reborn in a hell realm, or as an animal or hungry ghost. In another sutta in the Aṅguttara Nikāya, the laywoman Sāmāvatī is mentioned as an example of someone who excels at loving-kindness. In the Buddhist tradition she is often referred to as such, often citing an account that an arrow shot at her was warded off through her spiritual power. The four immeasurables are explained in The Path of Purification (Visuddhimagga), written in the fifth century CE by the scholar and commentator Buddhaghoṣa. They are often practiced by taking each of the immeasurables in turn and applying it to oneself (a practice taught by many contemporary teachers and monastics that was established after the Pali Suttas were completed), and then to others nearby, and so on to everybody in the world, and to everybody in all universes. A Cavern of Treasures (Tibetan: མཛོད་ཕུག, Wylie: mdzod phug ) is a Bonpo terma uncovered by Shenchen Luga (Tibetan: གཤེན་ཆེན་ཀླུ་དགའ, Wylie: gshen-chen klu-dga' ) in the early eleventh century. A segment of it enshrines a Bonpo evocation of the four immeasurables. Martin (n.d.: p. 21) identifies the importance of this scripture for studies of the Zhang-Zhung language. Prior to the advent of the Buddha, according to Martin Wiltshire, the pre-Buddhist traditions of Brahma-loka, meditation and these four virtues are evidenced in both early Buddhist and non-Buddhist literature. The early Buddhist texts assert that pre-Buddha ancient Indian sages who taught these virtues were earlier incarnations of the Buddha. Post-Buddha, these same virtues are found in the Hindu texts such as verse 1.33 of the Yoga Sutras of Patañjali. Three of the four immeasurables, namely Maitri, Karuna and Upeksha, are found in the early Upanishads of Hinduism, while all four are found with slight variations – such as pramoda instead of mudita – in Jainism literature, states Wiltshire. The ancient Indian Paccekabuddhas mentioned in the early Buddhist Suttas, those who lived before the Buddha, mention all "four immeasurables" and Brahmavihara, and they are claimed in the Suttas to be previous incarnations of the Buddha. According to Peter Harvey, the Buddhist scriptures acknowledge that the four Brahmavihara meditation practices "did not originate within the Buddhist tradition". The Buddha never claimed that the "four immeasurables" were his unique ideas, in a manner similar to "cessation, quieting, nirvana". ↑ Bodhi, Bhikkhu. Abhidhammattha Sangaha: A Comprehensive Manual of Abhidhamma. BPS Pariyatti Editions, 2000, p. 89. ↑ AN 4.125, Metta Sutta. See note 2 on the different kinds of Brahmas mentioned. ↑ Rhys Davids & Stede, 1921-25, Pali-English Dictionary, Pali Text Society. ↑ Peter Harvey, "An Introduction to Buddhist Ethics." Cambridge University Press, 2000, page 104. ↑ Bodhi 2012, p. 1618. ↑ W.E. Soothill and Lewis Hodous, 1937, A Dictionary of Chinese Buddhist Terms. 1 2 3 4 Merv Fowler (1999). Buddhism: Beliefs and Practices. Sussex Academic Press. pp. 60–62. ISBN 978-1-898723-66-0. 1 2 3 Peter Harvey (2012). An Introduction to Buddhism: Teachings, History and Practices. Cambridge University Press. pp. 154, 326. ISBN 978-1-139-85126-8. 1 2 3 4 Harvey B. Aronson (1980). Love and Sympathy in Theravāda Buddhism. Motilal Banarsidass. p. 71. ISBN 978-81-208-1403-5. ↑ Gombrich 1997, p. 84-85. ↑ Gombrich 1997, p. 62. ↑ Majjhimanikaya, tr. by Kurt Schmidt, Kristkeitz, Berlin, 1978, p.261, tr. by Tony Page. ↑ Bodhi 2012, p. 112. ↑ "Sāmāvatī". Dictionary of Pāli Proper Names. 2. Wilts: Pali Text Society. 1938. Yamamoto, Kosho (tr.) & Page, Tony (revision) (2000). The Mahayana Mahaparinirvana Sutra. London, UK: Nirvana Publications. The Four Sublime States by the Venerable Nyanaponika Thera.